Retro style is bold and bright, with primary and pastel colours taking centre stage. Shades of red, orange, green and purple are fabulously chic, but they’re not for the faint hearted. If you’re not quite brave enough for bold block coloured walls, a set of beautifully bright stools to contrast against a neutral breakfast bar will do just as well. Round or crescent shaped stools like our Padded Crescent are ideal for adding that nostalgic vibe. Available in a spectrum of funky colours, they’re also incredibly comfy due to their encompassing shape. 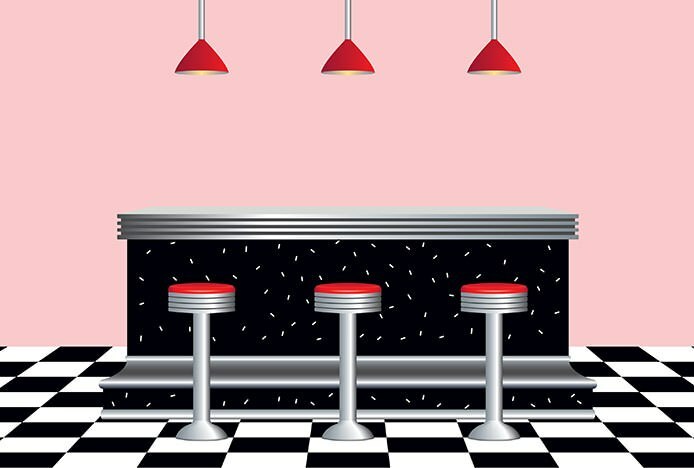 Nothing is more retro than the 1950s American diner. 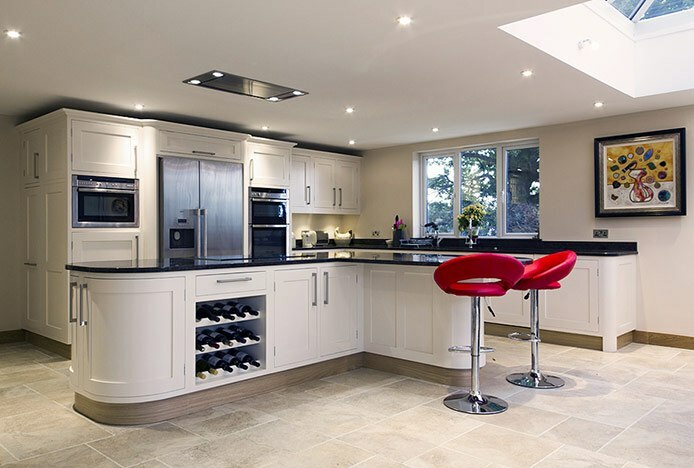 Full of character, it’s ideal for kitchens with elevated seating lined up along a breakfast bar or island. For that authentic all-American feel, choose kitchen stools that pair mirrored chrome frames with faux leather upholstery. Whilst sleek chrome exudes that high gloss appearance reminiscent of the metalwork on classic Cadillac cars, faux leather seat pads ensure comfort as well as allowing for a myriad of vibrant colours. Combine red, black, white and teal for a timeless aesthetic, or experiment with a playful pastel colour palette. 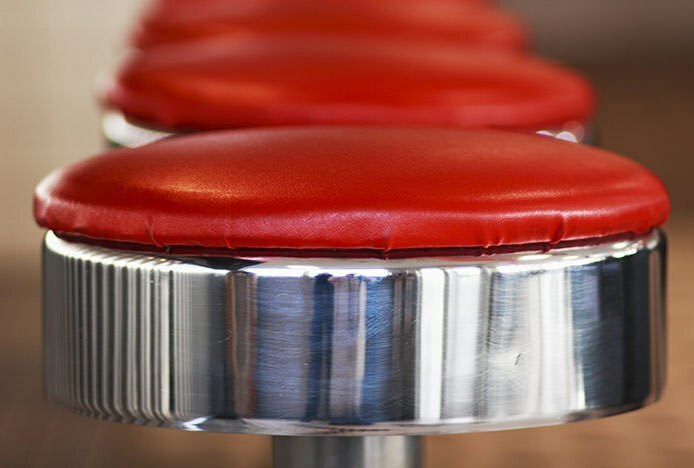 For examples of furniture with this iconic style, check out our popular Java and Skyline bar stools. 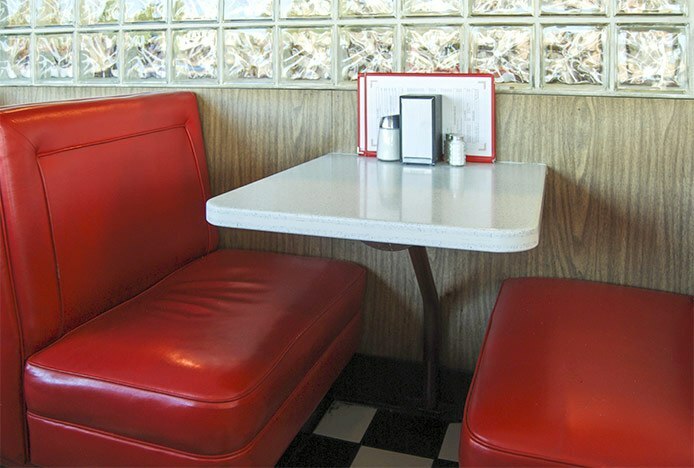 For that authentic diner style aesthetic, why not consider a booth instead of a standard table and four chairs? Simply fit a faux leather upholstered bench against one of the walls of your kitchen, add a classic Formica table and a scattering of retro-inspired chairs, such as the Candy, and voila – you’ll feel like you’re on the set of Happy Days every time you sit down to breakfast. This is a particularly good option if you’re short on space. The booth can be fitted around the corners and grooves of your kitchen, and you can make it as big or small as you like. Plus, you can even add some hidden storage space within. If you’re renting your home, you probably won’t be able to make any major alterations to the interior design. If it's only temporary it's likely you won’t want to invest too much in it either. Hanging a few colourful pieces of art is a simple solution, making a quick and easy way to personalise a neutral space. However art doesn’t necessarily refer to paintings or fancy oil-based canvases. 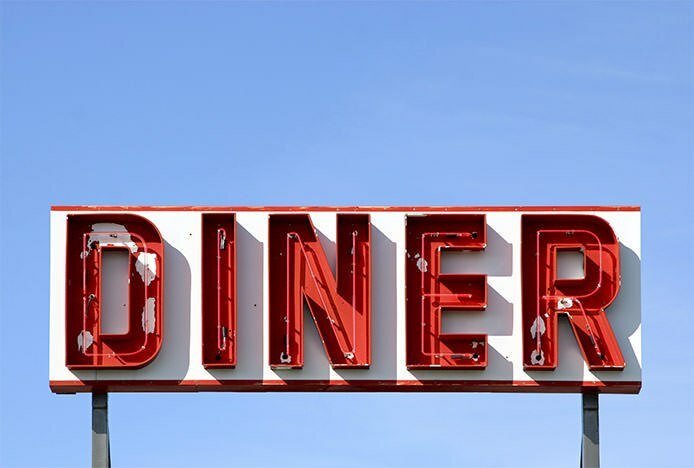 Think outside the box and decorate your walls with a vintage tin sign, a framed movie poster from the 50s or 60s, a neon diner-style sign, or even just a feature clock in a bold colour. These little touches will add a shot of personality into a plain or neutral kitchen, and the best thing is you can take it all with you when you move. 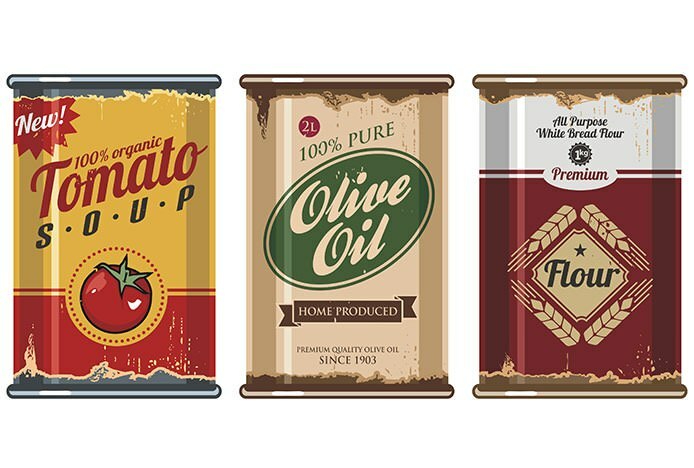 Retro packaging is a great way to update your kitchen look without making substantial changes. Store utensils in mason jars or cream coloured tins, and add little quirky touches with items such as a diner-style straw dispenser, mini gumball machine or jukebox. Display similarly coloured ceramics and jars on open shelving for an eye-catching look, and scour charity shops, car boot sales and vintage fairs to find old cake tins with just the right amount of rust on them. After all, there’s nothing more retro than a bit of wear and tear. The black and white checked kitchen floor first came into style in the 1960s, and it’s rarely been out of fashion since. Marvellously monochromatic, black and white work with every colour scheme and the chequered pattern can be replicated in tile or lino, to suit any budget. Similarly, a deep pile rug will never date and looks great underneath a kitchen or dining room table, bringing that swinging 60s vibe to your home. Need a few more ideas? 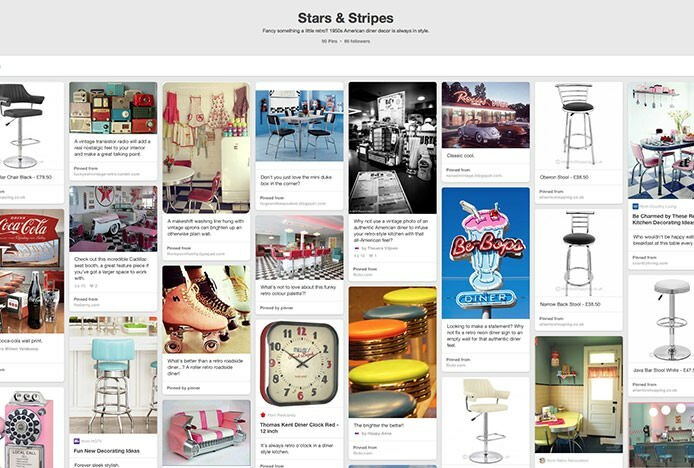 Why not browse our Stars & Stripes Pinterest board for further interior inspiration. Nicely neutral, versatile cream dining sets boast soothing tones and classic charm..
For the most popular kitchen features of the year, check out our list of must-haves..